Another breakfast recipe from Delicious desi which has main ingredient egg. This is an easy breakfast option. My husband loves egg and he can have it in any form. 1. 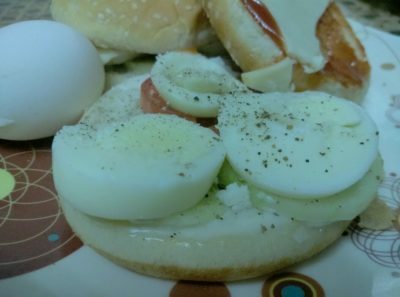 Boil eggs, peel and then cut them into round slices. 2. Heat a tawa. Cut burger buns into two halves.Heat butter in a pan and shallow fry burger buns. 3. Apply mayonnaise on bottom part of bun and tomato ketchup on other half. 4. Put onion slices, tomato slices, and then cucumber slices. 5. Put egg slices on it. Sprinkle salt and black pepper over it. 6. Put cheese slices over eggs and cover with other half. Serve and enjoy. This entry was posted in Anupama Magic, Breakfast recipes, Egg recipes and tagged cucumber, Egg, tomato. Bookmark the permalink.